I like investing in index funds. They give me great diversification, market returns, and don’t cost much. It’s a lot easier to buy all the stocks with one click than it is to research individual stocks, decide which to buy, when to buy, and whether or not or when to sell. Some people prefer the latter because they find it fun. Or they want to hit a home run. And I have no problem with that. The only publicly traded individual stock I’ve invested in is Berkshire Hathaway, but I do have a little “play money” that I’ve used to invest in small businesses in the startup stages. I currently have an ownership stake in a small craft brewery in the community in which I used to live in Michigan. I’ve also loaned money to help a small town Minnesota brewery get off the ground. Both are thriving and theyprovide me with plenty of liquid dividends (a.k.a. free beer). Things are going so well, I may be evaluating another brewery investment opportunity in the near future. While angel investing may not be a focus of the majority of my portfolio, I am, in fact, an angel investor. Today’s guest post comes from Elizabeth Cho-Fertikh, PhD, a cancer biologist with much more experience than me in the realm of angel investing. Enjoy! If you’ve ever watched an episode of Shark Tank or heard of tech investors of Silicon Valley making it BIG, leaving you wondering ‘how can I get in on that?’, then you were thinking of angel investing, whether you were familiar with this term or not. So what exactly is angel investing? The term ‘angel investor’ interestingly originates from a time when wealthy individuals, known as Theatre Angels, provided capital to Broadway productions to prevent them from shutting down. The term expanded to describe those who invested in startups, in general, in the 1970s. Following the market crash & downward tailspin of the economy in 2008, angel investor numbers shot up and now there are approximately 300,000 angel investors in the US according to the Angel Capital Association, the primary industry association (ACA). As a group, angel investors tend to be highly educated, high net worth individuals who invest capital in startup ventures in exchange for equity or convertible debt in the venture. The hope of garnering significant profit with either the sale or other major liquidity event of the startup is a major goal. And yes, most of you, as Physician on Fire readers, would likely qualify to become angel investors. There’s no test or interview to become one; by virtue of investing in a startup, you instantly become one. 1. When done with some understanding of the process and a fair amount of research (due diligence) into a startup, angel investing has historically returned at rates higher than market indices such as the S&P 500. Take a look at the graphic below, which provides a comparative track record over nearly 30 years of returns by asset class. Simply put, angel investing can rocket past traditional investment classes boosting your overall portfolio returns! If we dig deeper and peel away at an average angel investor’s portfolio, we see how the oft-used baseball analogies hold up: for about every 10 investments, 1-2 yield home runs that more than make up for the approximately 3-4 base hits and 3-4 losses. 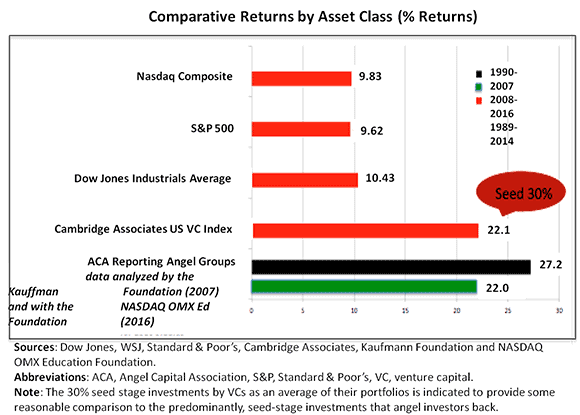 According to a 2016 study published by the Angel Resource Institute, angel groups reporting from 1990 – 2016, showed a strikingly consistent trend in returns over the years (see graph below): the median investment was a loss, while the mean has been a 2.5X multiple of the original investment. Approximately 10% of all investments resulted in the 10X-30X+ homerun return on investment (ROI) and netted 85% of all cash returns. 2. A second major draw for angel investing: privately held startup companies are not subject to the price/value fluctuations of publicly traded companies. We’ve recently experienced another market drop with all wondering: have we reached the bottom? When will the market swing back up and by how much? On the other hand, if you own a major portion of a privately held startup and find yourself on its Board or serve as an Advisor, you can possibly have some say in the venture, and therefore some control over your investment. This type of interaction has been common for members of our team. If you think about it, startups only stand to benefit from some complimentary expertise of an investor who has a stake in the company’s success! 3. The tax benefits of angel investing tend to fall under the lower, long-term capital gains tax rate as the duration of investments in startups is typically much longer than the one-year holding period needed for the long-term gains tax benefit. Compare this to the buying and selling of public market stocks in less than a year: capital gains here are subject to the higher, short-term gains taxes which can differ in rates from long-term tax rates by as much as 15%, possibly more. Consult with your accountant as the difference will vary based on income, the capital gains, length of investment holding period, and tax filing status. 1. There is a positive correlation between the hours spent on due diligence — industry term for the ‘research’ that is conducted into a startup, its founders, the marketplace, etc — and ROI. 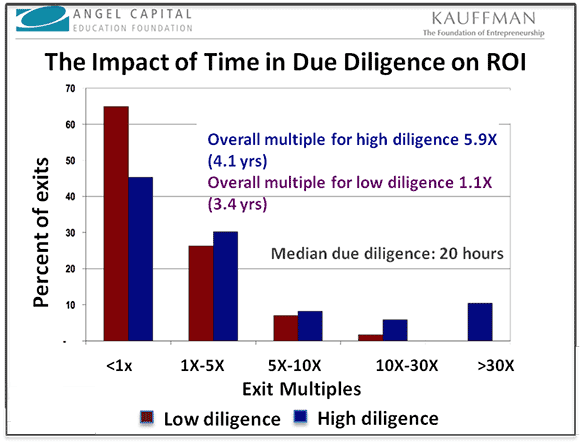 A study by the Angel Capital Education Foundation and the Kauffman Foundation for Entrepreneurship revealed a significant, near 6X difference in ROI between high versus low number of hours spent on due diligence. It’s been our experience as well that the greater the due diligence, the higher the likelihood of a satisfying ROI. Up to a point of course. No need for thesis-type research taking years and no guarantees of a home run. You get the picture. 2. With due diligence being so critical and the many criteria that need to be evaluated, even seasoned investors do better when they conduct due diligence as a group. Not many of us have the expertise to single-handedly conduct technical, legal, tax, market, financials, etc. evaluation. So, while the advent of angel investing online platforms provides great convenience, try not to do the necessary due diligence alone. Or even if one is part of an angel investor group but prefers to operate independently, take the time to consult with colleagues who have the expertise that you may not to check under that rock XYZ, before you write that big check. 3. One can invest in both the seed stage and later revenue-stage ventures. The former group will come with higher risk as these early-stage startups are just getting their bearings and may not have market traction. But if they eventually succeed, the investment bump will be highest. The revenue-stage ventures will come with lower risk but less of the potential profit hike. Putting your investment dollars in both baskets is another way to de-risk and diversify your angel investment portfolio. So how does one get started, where can one find angel groups, how does one learn the basics of angel investing? The Angel Capital Association, as mentioned, is a rich resource for those who want to get their feet wet. The Center for Venture Research at the University of New Hampshire is also a helpful, educational resource. Some of the others mentioned in the blog are also chock full of information, such as the Kauffman Foundation and Angel Resource Institute. As for angel investor groups, there are many in the US and globally. Again, the Angel Capital Association is an excellent place to begin: it has over 400 US groups in their database, plenty to get anyone started. 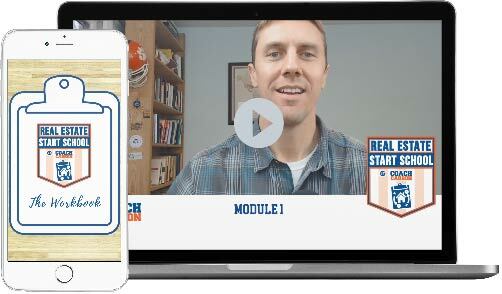 Many groups hold regular in-person meetings and will have online platforms where startups will upload their material– the ‘deal flow’ — that members can access. Virtual groups, as mentioned, have also entered into the foray such as AngelMD. Some groups are agnostic to the deal flow they accept & invest in; others may be sector-specific with quite a number focused solely on healthcare deals such as Life Science Angels and AngelMD. 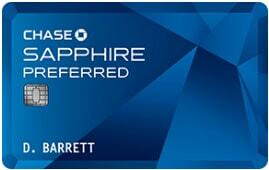 Nearly all come with an annual or quarterly membership fee. Do you have experience in Angel Investing? How have you performed due diligence? Tell us about your winners and losers in the comments below! I have to admit that when I watch Shark Tank there is a part of me that wish I got to the level the Sharks have attained so that I could invest in something that becomes wildly successful. But then I come to my senses a bit and realize it really is not for me. It is similar to watching shows on house flipping. 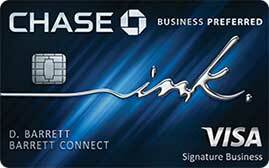 They make it look so easy and you think this can be a great way to make a ton of money. Typically these shows cherry pick the good cases and all the headaches, etc are conveniently edited out. In reality many a flipper runs into problems and can lose money if not careful. Hatton1 MD has a great story on her experience with angel investing (granted it is one of those wow cases and unlikely a wild case like that repeats itself (where the CEO of the company goes on a shooting rampage in the university she worked at). But basically it is buyer beware. 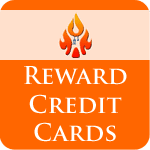 High rewards come with high risk and this should only be done with play money you don’t mind losing completely. Hello, this is Elizabeth Cho-Fertikh, the guest poster for “The Basics of Angel” Investing. TV glamorizes most things, you are absolutely correct. If one approaches angel investing on a prayer & a dime, then yes, it can be a crapshoot. But if one approaches it like medicine and any other discipline — thru sufficient study — angel investing can live up to the data shown in my post: on average, it surpasses the market indices like the S&P 500. 30 years worth of data described. I am a PhD scientist by training and like most others on my Venture Corner team, we entered angel investing from non-finance fields, including medicine & law. We all studied up, have done decently, can spot the weak deals and avoid them, etc. This is why we count on angel investing as the high growth, high return on investment piece in our diversified investment portfolios. This is definitely a high risk, high reward situation. Like you, POF, I am a passive index fund investor. One of the biggest reasons (outside the diversification, low cost, low fees, and strong anticipated returns that will get us to our goals) is that it keeps my nose out of things. Being someone who very much enjoyed playing Texas Hold ’em in college, I know that I enjoy the allure of “hitting it big” and part of my fear comes from not being able to control that urge if I started angel investing, lost money, and then got on the angel investing version of “tilt” after getting a bad beat. (Lots of poker terms there for those that haven’t ever played). Fortunately, I don’t have to make this decision right now. I don’t have the money to invest anyway 🙂 Once my taxable account becomes sizeable, I’ll have to consider how I will further diversify (likely through real estate, but angel investing is an option). Either way, I’d prefer angel investing and real estate to picking individual stocks, I think, as my form of “scratching the itch” of hitting it big. There is also a way to get into “angel investing” via “crowdsourced investing” that was part of law signed for the Jobs act of 2012. This is a very interesting area to invest that goes further than what you might know from Kickstarter or GoFundme. I have not done this but have following the technology and some of the companies handling this new way to invest. Check it out if you are interested in a small part of your investment strategy being in this category. Elizabeth Cho-Fertikh, the guest poster, once again. You are correct, crowd funding is another way to get into angel investing. The positive is crowd funders have less of an income/asset threshold to meet than with angel investors, per the JOBS Act and the SEC. The negative is that crowd funders don’t have the benefit of conducting due-diligence (the research) on an investment deal within a group, as angel investors do. The latter are usually members of some angel investing group (see my post). Data show that the more due diligence conducted, the higher the likelihood of a positive return on investment. Up to 6x – see post. For solid due diligence, you need to cover about 8 different categories requiring legal, financial, market & technical expertises. John Brzezenski here, also part of the Venture Corner team. I’ve been involved with angel investing for almost 20 years and, in addition to applied rigorous discipline to diligence and deal selection, it is definitely a best practice to build a portfolio of angel deals as well to help manage the risks. There are a number of risks at the earliest stages of a company’s life cycle (especially related to the market) that are unpredictable and hard to control, and the portfolio helps compensate for this. There’s debate as to what the optimal number of investments in the portfolio is, but if you have the opportunity to invest a smaller amount in 5-10 well diligenced, quality opportunities versus a larger amount in 1-2 opportunities, I would recommend the former and it’s likely to lead to better (e.g. risk adjusted) long term returns. I did some angel investing when I was living in London for a few years. They have similar accredited investor rules, but they’re a little looser over there. I was in a high-enough income bracket that they let me invest without me having to jump through any hoops and prove my US investment accounts were real. So far, three of my investments have completely failed, one is doing okay, two are doing VERY well and one sold to American Express. The exit was a funny one. I got 40% of my money back when they sold. That’s not a 40% return, that’s 40% of my money. My US investor friends say that basically never happens here–it’s either a 0% return (most of the time) or a multiple of your investment as a return (more rare). I’m taking a long view and it has been super educational, so I’m good with it for now. Welcome to the club! Sounds like your stats are right on the mark. Well done. That is strange that the venture acquired by American Express only brought in 40% of your initial buy-in, unless it’s valuation sank relative to when you invested. 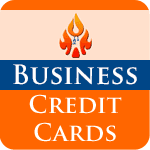 Perhaps American Express determined the company had some merit so decided to “rescue” it despite any downturn, if indeed this was the case. I’ve looked at some angel stuff, but the buy-in was too rich for me. Now that I’m part time, I have more time to research opportunities, but in practice have more interest in taking advantage of not working. I am involved with one startup and a micro-business, but since they are ours, I wager that wouldn’t qualify that as angel investing. 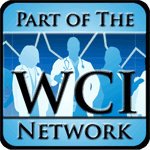 I’m a physician and accredited investor and generally follow the WCI principles. However I am single and live and work in SoCal, so I have the freedom to take on a bit of risk and got bitten by the Angel investing bug a while back. I’ve put about 15-20% of my portfolio into about 7-10 different startups or high risk alternative investments. It’s too early to report any results but I have no regrets so far. The important point is that when I invest in one of these, I basically consider the money lost from the get-go. In other words, I do NOT include that money at all in any retirement calculations. I think it’s important to have this mentality. Odds are that maybe 1 or 2 of those will perform well, which could more than make up for the other 6 or 8 that don’t. You’re wise to be well diversified. It’s easy to give up when 1 or 2 or 3 investments haven’t worked out. I’ve had good luck thus far in a couple of brewery deals, but I attribute that mostly to luck. 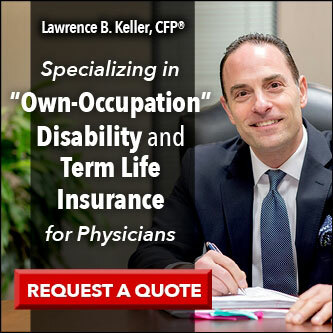 Hi Dr. K, glad to hear you’re trying out angel investing. Elizabeth Cho-Fertikh, the guest poster here. Your investing in several start-ups is a wise de-riskment strategy. I angel invest in both early stage and later, revenue-stage start-ups. Angel investing is not exclusive to just early stage deals. Revenue-stage ones have demonstrated traction with a business model that is proving out. With rigorous due diligence, the early stage, higher risk deals can be de-risked too. I know what you mean about considering the invested funds as “play money”. Having been in this for a decade and approaching it with strategy & study, my mindset is now more aligned with expecting to see some of my investment back and then some. It’s panning out now, as a result of these strategies and others, than when I first started angel investing, for sure. Practice and experience helps, as with anything. Conducting rigorous due diligence into a start-up deal cannot be underscored enough — makes a huge difference in de-risking an investment decision. Don’t Angel Invest!!! Ok, now that I have your attention, as someone who has done it myself I say Angel investing can have awesome returns for the few but averages a worse return than traditional investments overall, hence do not invest unless you are going to be really knowledgable. Just because you financially qualify as an angel doesn’t mean you are ready. My angel work has been mainly in medical device, which I have been in for 15 years and worked at startups. When you know the players and the space really well or you have a syndicate or lead investor that you can follow that you trust then go for it but until then wouldn’t it be better to just chill, learn, and make steady returns in more traditional investments? On what basis do you conclude that angel investing “averages a worse return than traditional investments overall”? I provide data from 30 years in the guest blog comparing traditional investments vs. VCs vs. angel investing, showing that angel investing has done better than traditional. Regardless, I respect your perspective. Thanks for your reply Elizabeth. You make a fair point that I should explain and your post is well put together. My concern is not meant as a rebuff but rather an added caution to would be investors. I should be more clear with my concern over worse returns than traditional investments. In my experience, angel investing is not a level playing field. There are well connected and educated angel groups that get in on the quality deals and re-invest in subsequent rounds which pumps up the average return data. As your data shares, approximately 10% of the deals account for 85% of the return and rigorous due diligence makes a huge difference. 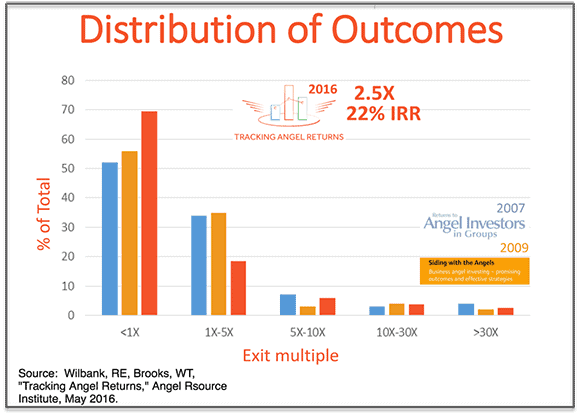 If this winning 10% was distributed among all angels equally, you get an average return of 27% which trounces traditional investments. However, if it is not equal, you have a few angel groups making substantially more than 27% return and the majority of investors losing money. This is what I have seen happen to many over my time in the angel world. It is also worth pointing out that the 27% average return is based on ACA reporting angel groups right? 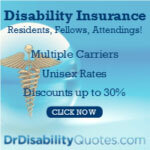 Those dilettantes who did a few deals and lost their fun money are likely not the ones reporting back to ACA while those highly active and organized teams comprised of semi-retired investment bankers, industry vets, and ex McKinsey and Deloittes are probably reporting back and interested in the shared results. This may be a reason to be cautious as I advocate, and a reason to join a group as you advocate. Fair? Nice article and interesting investment alternative. Just a question to the comparison graph : Is the yield ranking of Dow vs S&P vs Nasdaq correct ? Most of the time the Nasdaq should have outperformed the Dow as far as I remember, apart form very specific entry points (maybe a dotcom bubble effect ? ). You are right that the Nasdaq has generally outperformed the Dow & S/P, esp the past decade. The graphs represent average returns over 30 yrs: the Nasdaq has tended to be more volatile (tech stocks) & definitely plunged during the dot.com bubble & remained so for a couple years, you are correct. Early 2000s. The important thing to consider is often, how long we want to be invested and at which point in time. Higher yield alone without patience and backup funds is difficult to find and manage, especially nowadays. Angel Investing seems to be a bit of a more extreme option on the Sharpe scale, but might be well suited for broad diversification in a portfolio.